We go through at least 2-3 pots of herbal tea every single day during the winter. Perhaps it’s because we keep our house quite cool, but I’ve become totally disinterested in drinking anything cold this time of year. I’ve been experimenting with hot toddy recipes. I really don’t like the taste of most hard liquors—I *ahem* indulged a little too much in my youth. But (at the risk of sounding twee) I really like liqueurs with interesting flavors and histories. My favorites right now are Drambuie and B&B. Neither is particularly strong (I’m a lightweight when it comes to booze). B&B is a mixture of Benedictine and Brandy. Anyway! 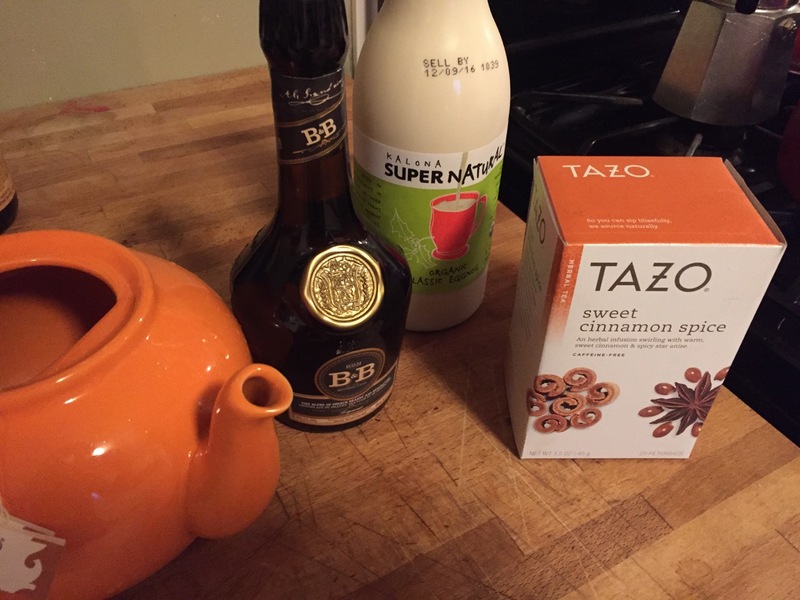 Here is my current favorite way to make a toddy. This one is perfect for trimming the tree, and my kids loved the alcohol-free version too. Brewed tea — any of the nutty or cinnamon flavored ones. My favorite is Yogi Tea Tahitian Vanilla Hazelnut. I also like Tazo Sweet Cinnamon Spice. Anything nutty and or warming-spicey. 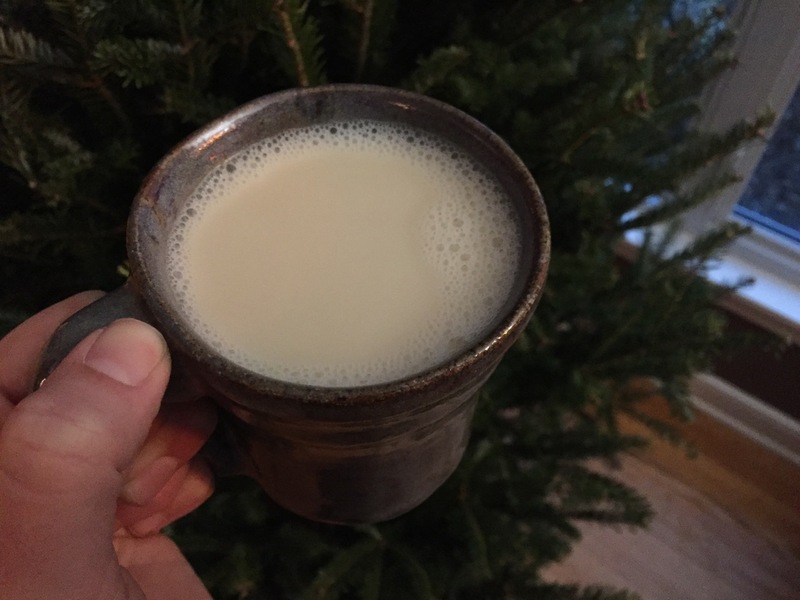 Eggnog — about 1/4 cup (adjust to taste). My favorite is Kalona SuperNatural. Mix in a cup and enjoy! Note: I would not use Drambuie in this recipe. It’s more suited to traditional hot toddy recipes, with lemon. Maybe I’ll work on developing a good reliable Drambuie toddy for January, when the co-op stops stocking eggnog. I read two garden-related books this spring, and am finally getting around to reviewing them here. I approached this book as I do all permaculture books: with skepticism. There are three aspects of many (most?) permaculture books that bother me. First, they are written by and for people living in more moderate climates than the upper midwestern United States. Second, they are written by people who have no profession other than doing permaculture stuff. Is this my bias, or is this generally true? Finally, they often encourage the planting of non-native, invasive species such as bamboo without warnings about the potential consequences to local ecosystems. 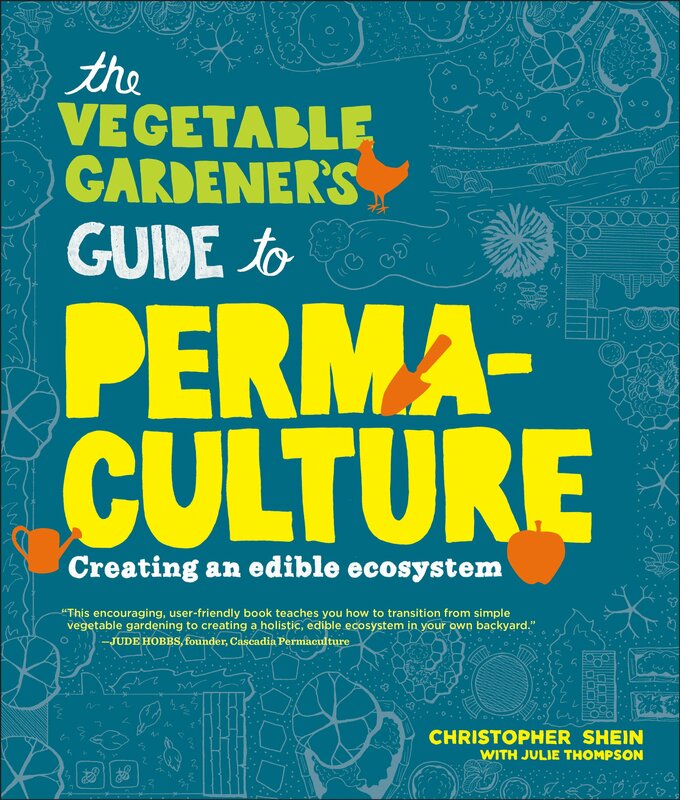 Having said all that, of course I support any book that makes the principles of permaculture accessible for normal people, and this book fills that niche just fine. It features gorgeous photos of permaculture principles at work in some very productive California gardens. This book includes lots of practical advice for the novice vegetable gardener; for example defining monoculture vs polyculture and outlining the benefits of growing many different types of things. I have seen this in my own garden this year: instead of growing just one type of leafy green, I’m growing kale, swiss chard, collard greens, French sorrel, and mesclun lettuce mix. 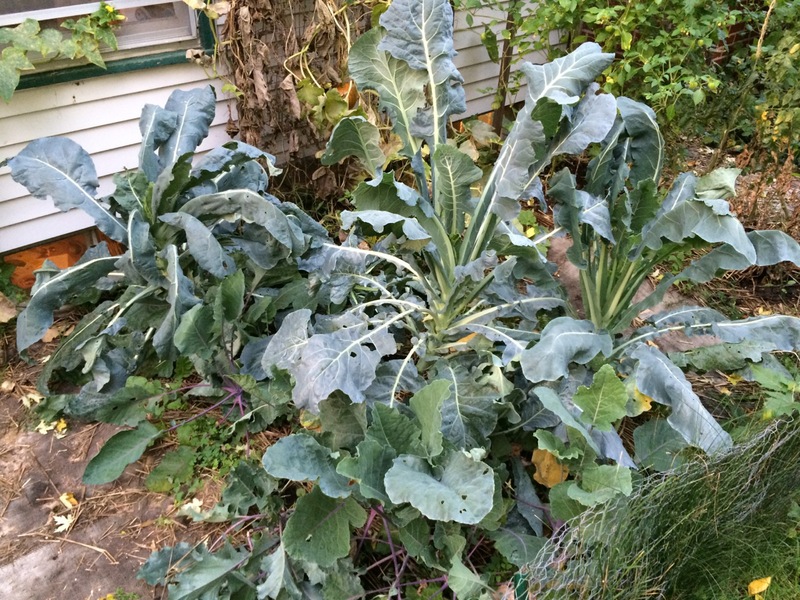 When my collards were under attack from cabbage worms several weeks ago, we ate lettuce instead. Now that my collards have recovered and my swiss chard is full of leaf miners, well, you get the idea. When you plant a variety of things, a crop failure of one is not devastating. Another criticism that I could lodge at some permaculture books is an oversimplified view of how nitrogen-fixing crops work. Until very recently, I too was under the impression that placing any nitrogen-loving plant next to a nitrogen-fixing plant was a solid move all throughout the growing season. But that’s not true. And I could have learned how it worked just by checking Wikipedia! It’s a subtle difference, but it’s important: nitrogen-fixing plants (such as legumes like beans and peas) have little nodes on their roots. These nodes are where excess nitrogen (pulled from the air) is stored. When the plant dies, this nitrogen is released into the soil as the nodes/root system break down. So yes, they benefit the soil, but only after they die. This explains why I had to eventually consider my interplanting of snow peas and cucumbers to be a fail. 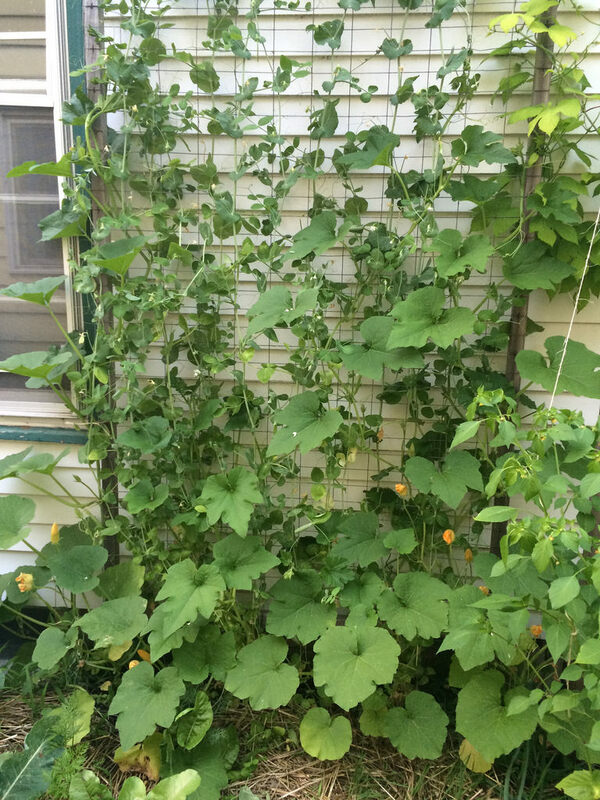 I tried it for two years—it made so much sense to me that my cucumbers could climb up the snow peas and then eventually just replace them on the same trellis. The problem was, right up until the moment the snow peas died, they were actually competing with the cucumbers for water and nutrients. My cucumbers’ growth was slow until the snow peas finally died off in early July. When the peas died off, the cucumbers really came to life (which supports the science that nitrogen is released when the plant dies). In a long growing season, this might be OK, but not with my short Minnesota window. My yields of cucumbers were less than in previous years. I suspect that many “dynamic accumulators” in permaculture are just like this. Take comfrey, for example. 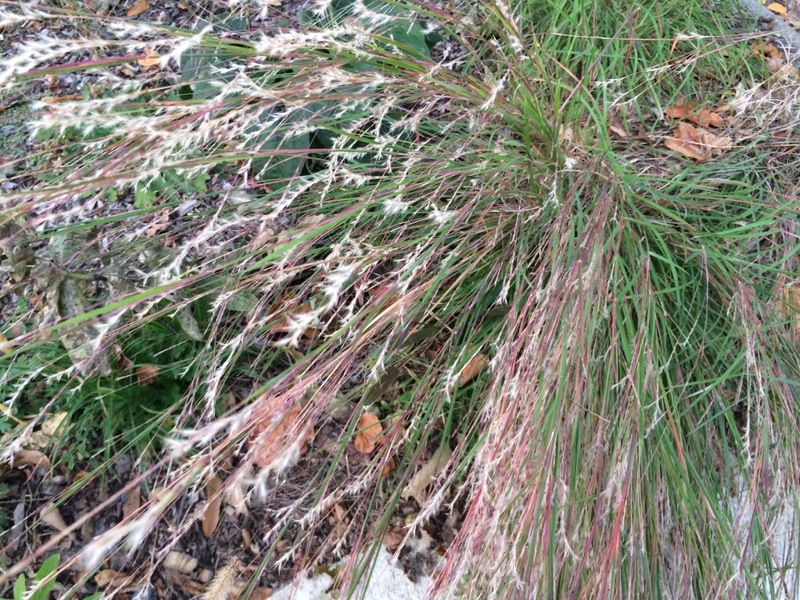 The plant doesn’t do much for you when you just leave is sitting in its spot (except spread and become invasive). You must remove much of its foliage several times per growing season and either add it to your compost, make comfrey compost tea with it, or use the leaves as a weed-suppressing mulch. If you’re not willing to commit to that, you should think hard before planting it. 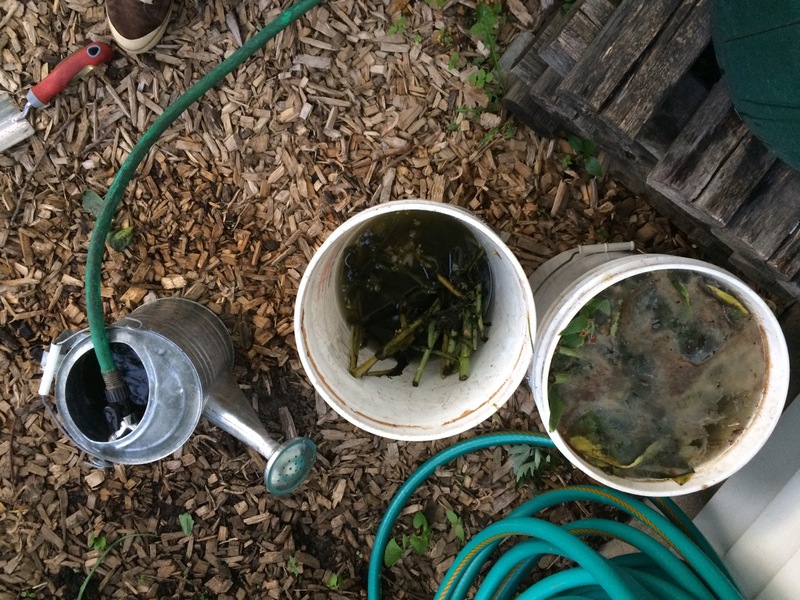 I made comfrey compost tea earlier this summer, and WOW did it smell awful! I pulled out most of my comfrey plant (don’t worry, it came right back), placed it in two 5-gallon buckets, then let it ferment for 2 weeks. Then I watered it down about 50% and poured it on many vegetables and shrubs. Everything responded well to the treatment except my peppers, which looked a little stressed afterwards. If I use it on them again, I will water it down further (to 25% or less). But I digress. I checked The Vegetable Gardener’s Guide to Permaculture out of the library, but I won’t be buying it. It gave me a few new ideas, but was mostly review. It’s fine for beginner vegetable growers and people who are curious about permaculture, but not really for me. Here’s a book written just for me and my fellow cold-climate gardeners! 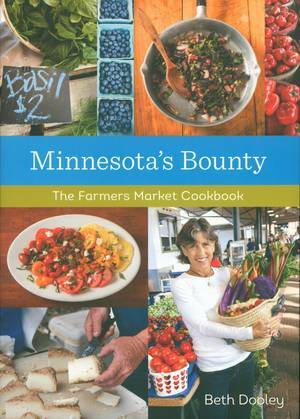 It’s a list of many different vegetables that one can find at our great Minnesota Farmers Markets, from common vegetables like potatoes and peppers to the more unique varieties: bitter melon, okra, sunchokes and the like. There’s also a short section for meat and fish, such as lamb, poultry, and bison. For each item, Dooley provides at least one recipe (usually three or more), plus Quick Ideas—simple preparations with ingredients you’ll already have on hand. My favorite “quick idea” was the idea of soaking rhubarb overnight in water, discarding the stalks, then sweetening to taste for a rhubarb-ade. 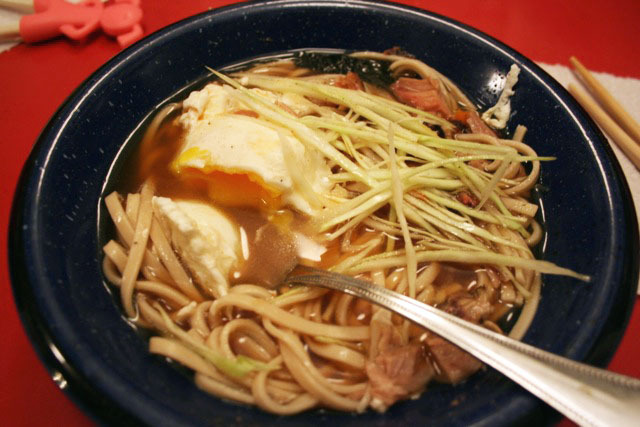 I tried several of the recipes, and they were all satisfactory and easy to follow. 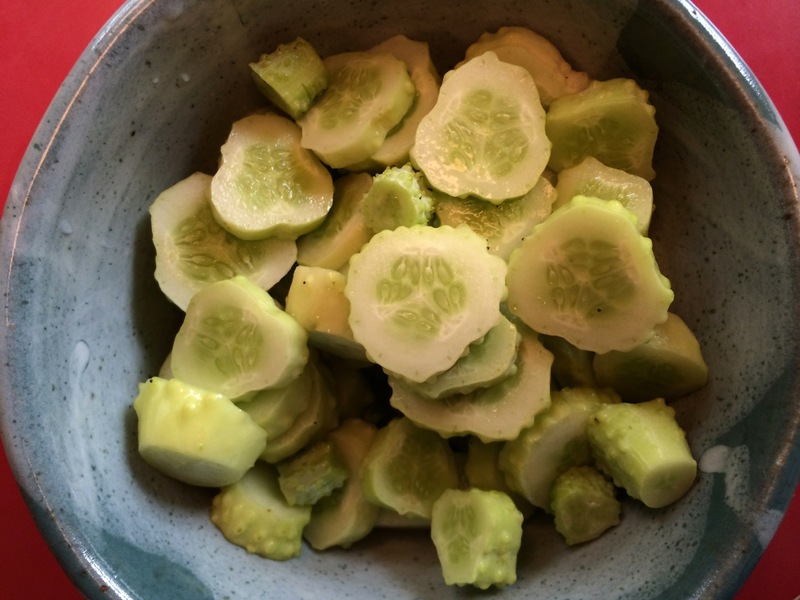 The shining star was a salad of radishes, cucumbers, and tomatoes with a cider vinegar-honey-fresh mint dressing. I cheated a little and bought hydroponic cucumbers and tomatoes so that I could make it before the book was due back at the library. It was delightful, and I’ll be copying down that recipe to make it again. I also tried a stir-fried bison with spring vegetables recipe that was a little bit ho-hum. The sauce was not very flavorful—I’m spoiled by a husband who doesn’t even use a recipe to make a damn good stir-fry sauce. Shall I pin him down on his methodology and share it with you? I will try. The primary reason I checked this book out was in search of savory rhubarb recipes—I would like to move beyond cakes, pies, scones, etc. This book did have a delicious rhubarb “pandowdy” recipe (a type of upside-down pie), but no savory ideas. I will try to check out Kim Ode’s Rhubarb Renaissance next. I get more rhubarb than I can use; I’ve become that neighbor who gives away rhubarb to anyone who will take it. I enjoyed this book, but I don’t think I’ll buy this one either. I have somewhat limited book shelf space, so my standards are pretty high for a cook book. Ingredients-based books like this are great, because they provide a resource for that moment of “what do I do with all these collards?” But then again, it’s even easier to just google “collard green recipe” or “red currant recipe.” That was how we found our beloved red currant pie recipe, which Adam is making right now! 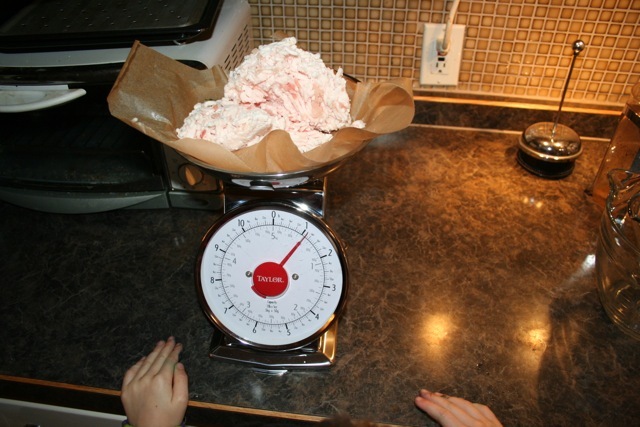 Do you know any savory rhubarb recipes? I’d love to hear about them. Categories: Cooking and baking, Gardening, Permaculture, Practical, Theoretical | Tags: book reviews, edible landscaping, FAIL, Permaculture, recipes | Permalink. It’s time for me to come clean. After last week’s native plants manifesto, I realized I’m a giant hypocrite because I plant an entire garden of non-native annuals every single year. Yep, that would be my vegetable gardens. And I’m not giving them up. So, now that my confession is over and you’ve forgiven me (right? ), let’s talk about something positive: the harvest. We have more Long Island Cheese pumpkins than we know what to do with. My decision to grow them this year (at our community garden plot) was 100% fueled by this post and accompanying recipe. We made the soup last night and it was good. Subtle, but good. Once cured, these pumpkins do have a pretty great flavor. I’ll bake them up one at a time (because I can literally only fit one at a time in my oven) and freeze the flesh for pies, breads, pancakes, etc. I’ve also given a few away to friends and family. So fun to have a big success! No year is complete without a few fails: my Romanesco Broccolli still has not formed heads and I don’t see how it will now, since the sun has now dipped behind my neighbor’s roofline for most of the day. I also crowded too many plants in this little space. 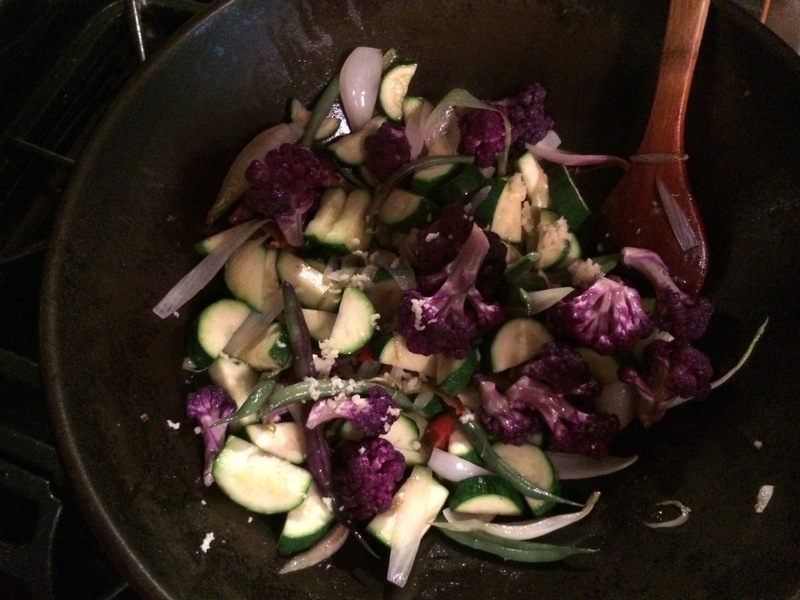 The broccoli and cauliflower really shaded the purple kohlrabi. 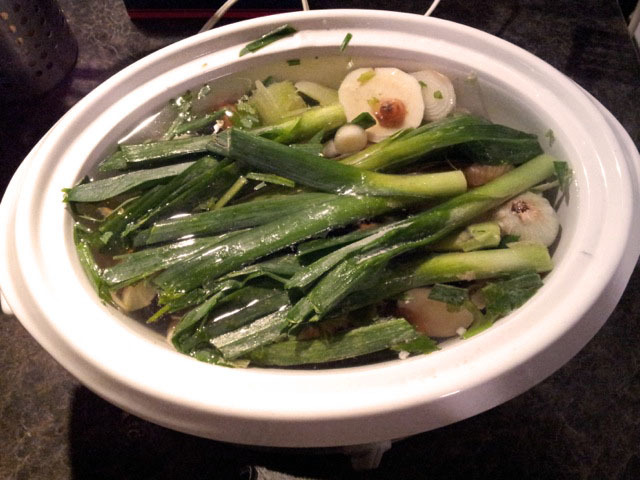 There are one or two edible kohlrabis in there, but the rest are mostly greens. I’ll still cook them up—all are edible. I think we ran out of the large amounts of sunlight the Romanescos need, just at the time they need them. This particular spot is truly a short-season garden. Speaking of fails, here’s another one that only recently came to light. We started talking to a fellow home-brewer at National Night Out, and realized that we are not growing the right kind of hops (he informed us with his nose in the air). We have Golden Hops; apparently they’re not really recommended for brewing. No wonder the homebrew we made with them last year didn’t taste quite right! We were planning on removing this vine anyway next year. 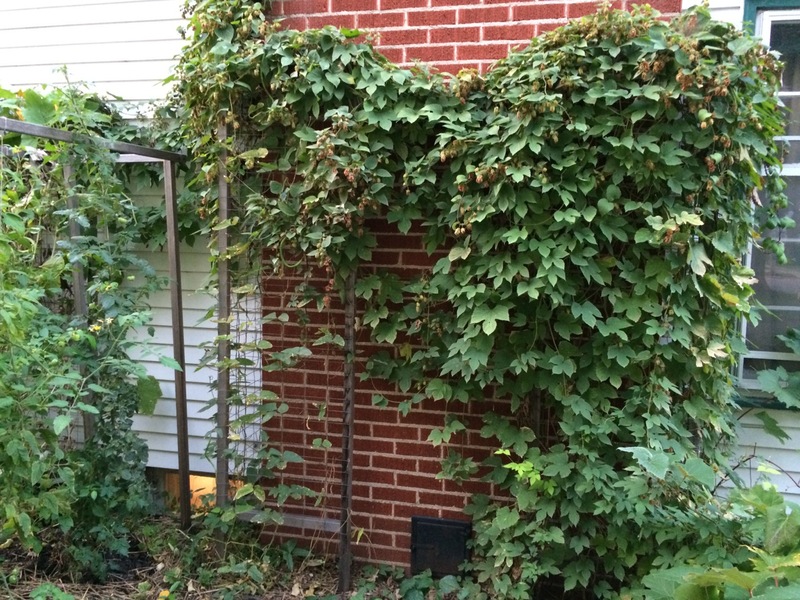 It has gotten too big for this little garden spot, and we might just let it die and replace it with Cascade, or another traditional brewing hops plant. 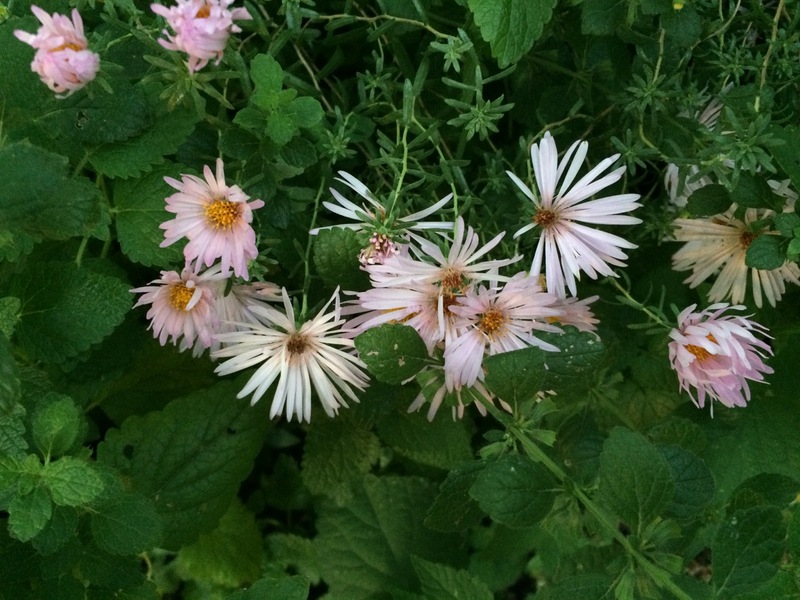 Even Master Gardeners can make big mistakes! Enough of the fails, in a year where we have SO MUCH for which to be thankful. One of those things was the opportunity for me to take a Friday off work in August so that the family could go pick blueberries in eastern Wisconsin. We made quite a few (18?) 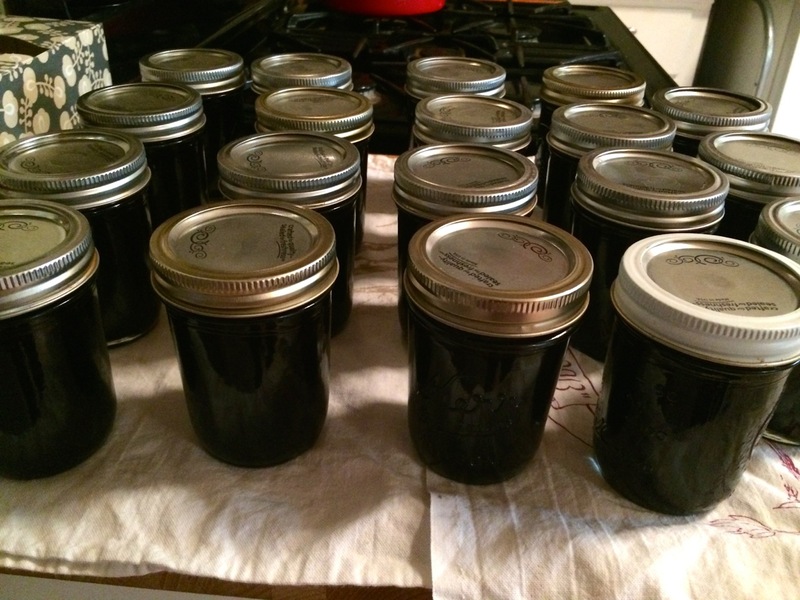 half-pints of this simply amazing blueberry preserves recipe, and have been enjoying it weekly since. I never grow enough tomatoes for canning, so as usual I purchased 40 lbs of canning tomatoes from Gardens of Eagan—the best value I’ve been able to find at $1/lb. I had grand plans, and my best friend and I thought we could drink wine and can tomatoes at the same time. You can imagine how much we actually got done! 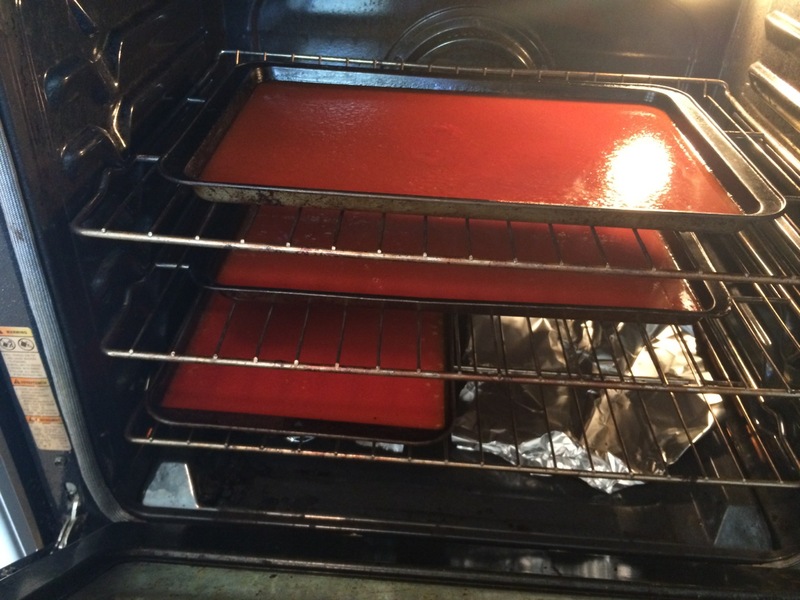 We processed 1/3 of them raw, while another 1/3 of them baked in the oven using Trout Caviar‘s roasted tomato recipe. 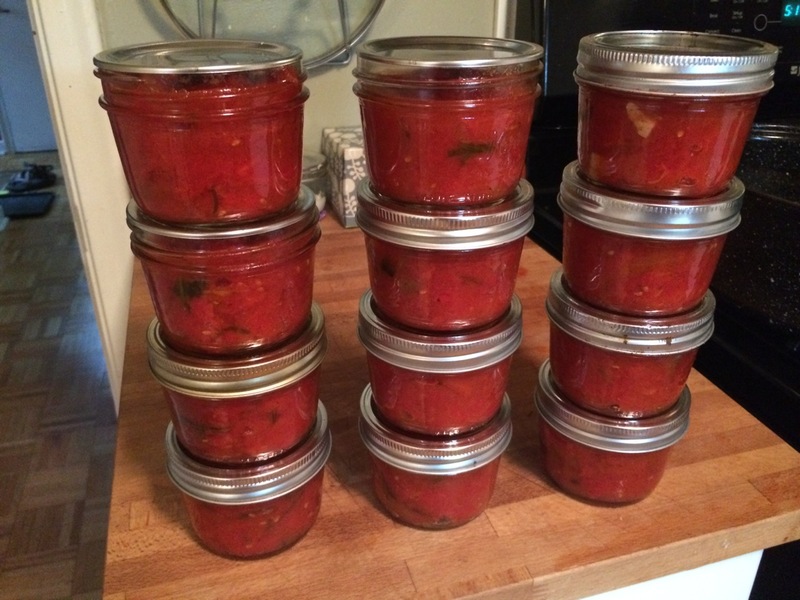 We intended to can the roasted tomatoes in these half pints (we use them as a pizza sauce base), but ended up freezing them because my patience for the canning process is wearing thin, in general. Later that week I still had 1/3 of the tomatoes to use up, so Adam and I tried our hands at tomato paste, using this recipe. It was easy! I’ll definitely do that again. We froze the resulting paste in ice cube trays and I have a feeling it will be gone before the new year. 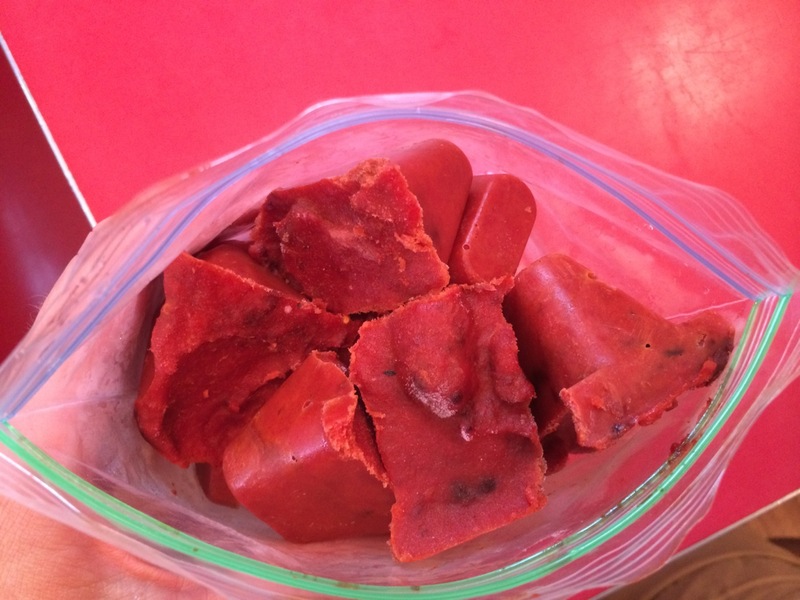 Frozen cubes of tomato paste, ready to be used. 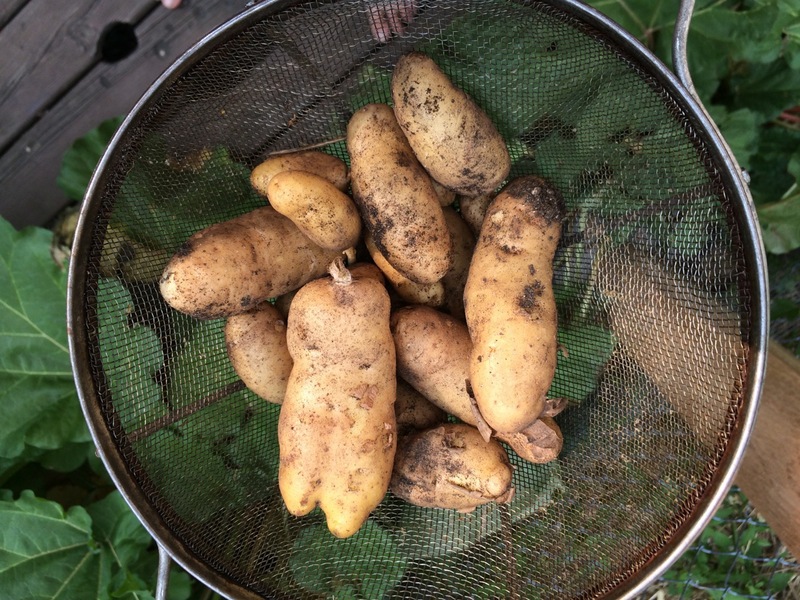 We dug up three final hills of “La Ratte” fingerling potatoes the first weekend of September, from our community garden plot. They seem to be storing pretty well so far, but we’ll use them up before we really test how long they can last. 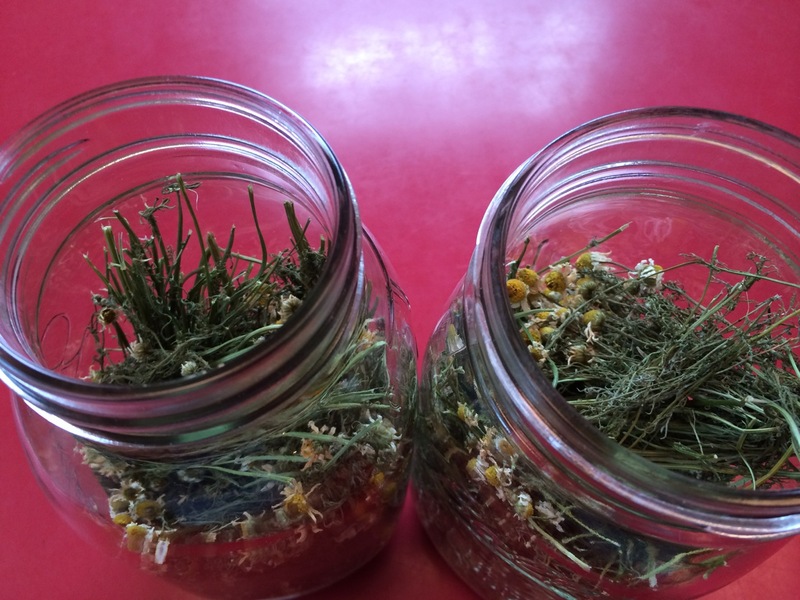 I didn’t dry quite as much mint as I usually do, but I doubled my usual amount of dried chamomile flowers for tea this winter. Good thing too; we’ve already run through one minor illness in the first month of school. Over in the prairie boulevard, Little Bluestem is turning absolutely gorgeous. In the backyard woodland garden, this wee little aromatic aster (mixed in with some lemon balm) is adding a nice little splash of color. We have two remaining harvests in our community garden plot, too: our brussels sprouts and Anneke’s strawberry popcorn, which is close to being ready. Part of me wishes we would have a freeze to sweeten up those brussels. We’re living on borrowed time right now here in the Twin Cities; the average first frost date is September 21. I hope this post has illustrated that every year in the garden, you have some successes and some failures. This blog is part of how I keep track of mine. It’s all part of the process, right?! Categories: Cooking and baking, Gardening, Practical | Tags: landscaping, native plants, pumpkin, tomatoes | Permalink. Towards the end of May, I realized that one of the other bus stop moms is a fellow real/whole foods enthusiast, AND she had kefir grains to share! 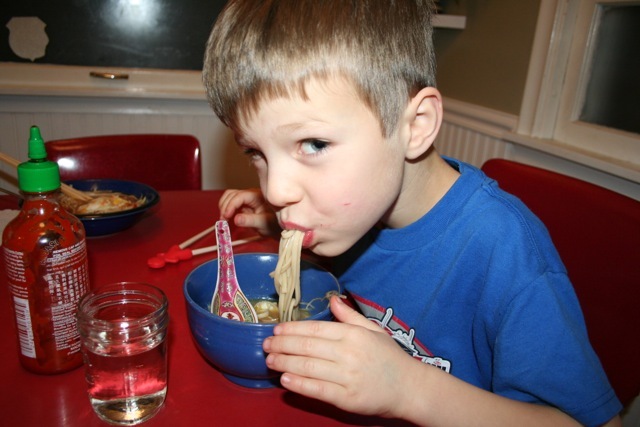 We’ve made 3-4 batches now, and we are still adjusting to the taste. Co-op kefir must have A LOT of sugar in it, because even after adding various sweeteners, this stuff is SOUR. I may use my next batch in place of buttermilk in a recipe and see how that goes. We’ve only managed to make two quarts of pickles so far, because we’ve been slicing them up, tossing them with a bit of salt and pepper, and just eating them fresh. 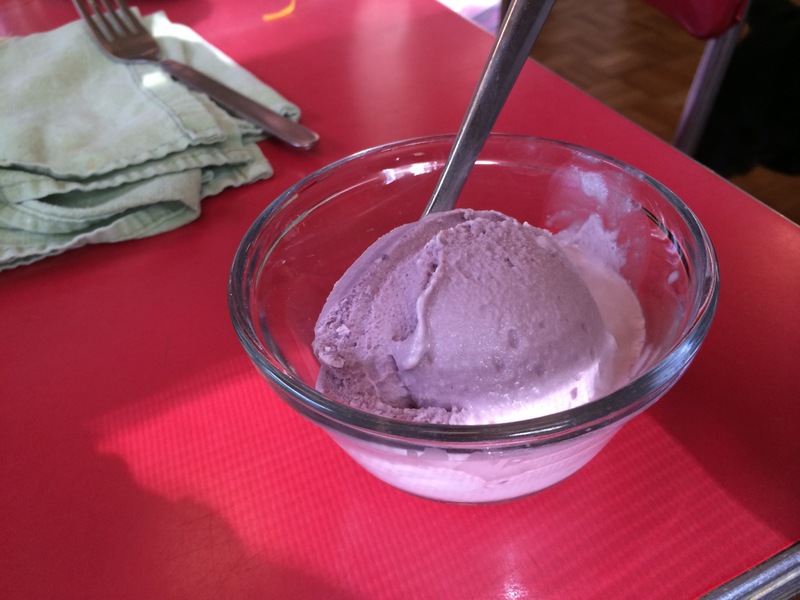 Earlier this spring, we tried a new ice cream recipe. We’re now sold on this new method. For a few years, we’d been stuck on Mark Bittman’s ice cream method, which is a little, well, involved. You make a custard that involves at least 3 but up to 6 egg yolks, then chill it, then finally put it in the ice cream maker. I don’t have anything against custard ice cream. It’s delicious. But with the price of eggs and our busy daily schedule, we just weren’t making it all that often. 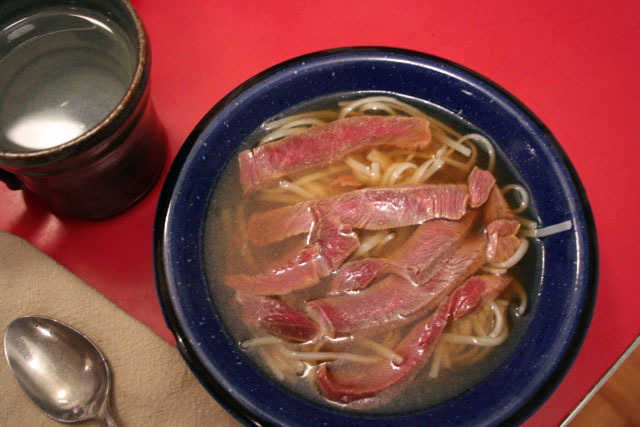 Now that we’ve switched to this new basic recipe we make it all the time. 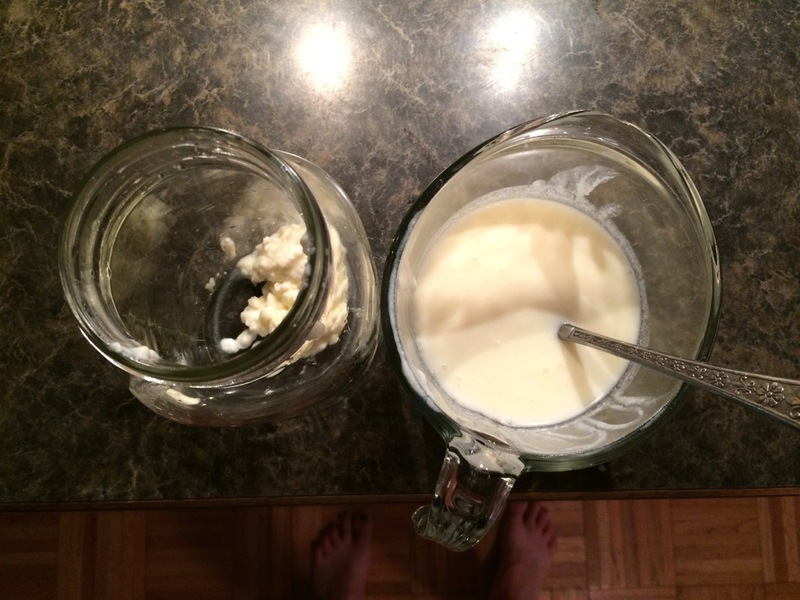 The basic recipe is: 2 cups cream, 2 cups whole milk, ~1 cup sugar, and then whatever flavoring you want. Whisk briskly, put it in the ice cream maker, 20 minutes later: done. Above, we added some mulberry juice (probably about 1/2 c.) that was still leftover from last summer. 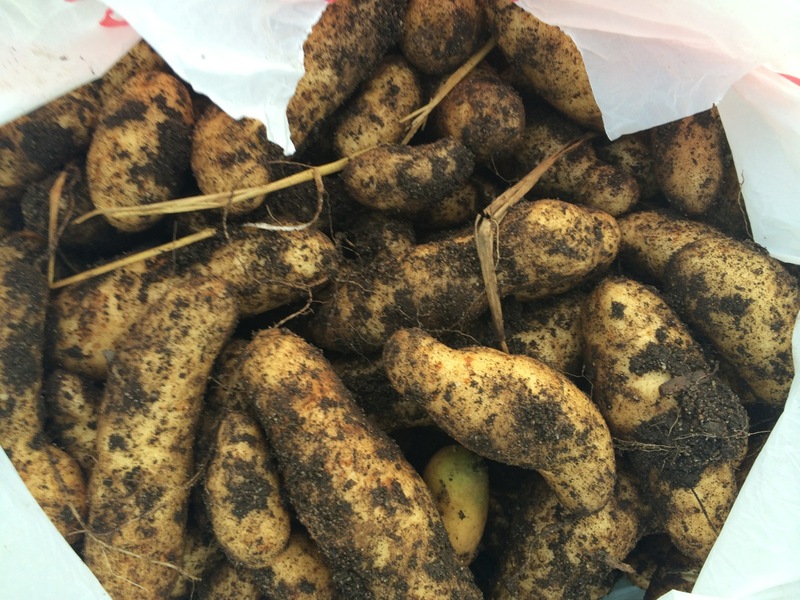 We’ve now eaten two hills of our French fingerling potatoes (La Ratte). These things are like buttah. Even the kids went on and on about how delicious they were, just boiled with a little butter, salt, pepper, and fresh parsley. Here is a quick fry-up of one of our purple cauliflowers, zucchini from the market (didn’t have room this year), onions and purple/green beans from the garden. They grow purple, but turn green when cooked. Pickling & canning season is really getting underway! Categories: Cooking and baking, Gardening, Practical | Tags: kefir, recipes | Permalink. This fall, his second year of bowhunting, Adam got a small buck and a doe. 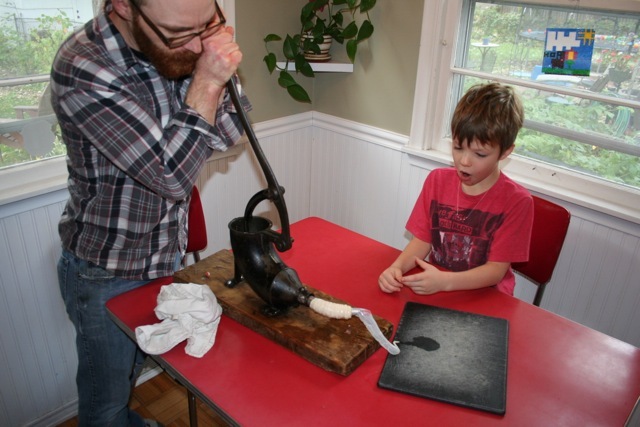 We’ve been itching to try our hands at sausage-making for a long time, so we borrowed the scary-looking family heirloom equipment from Adam’s parents and got to it. I’m not going to re-post the recipe, because we used this one verbatim for our first batches. For the second, third, and yes FOURTH batches, we varied the herbs but not the basic ratio: 4 lbs of ground venison and one lb of pork fat. The only thing we omitted was the Instacure (pink salt) after being assured by the Seward Co-op meat guys (they were very patient with me and my questions) that it was unnecessary. Yes, that is a pound of pork fat. The same week Adam got his first deer, my family split up all the meat from two hogs which my dad had purchased for us. Nobody else wanted any of the fat so I got all the fat from both animals. Seriously, we have a ton of pork fat in our freezer, so if you live in Minneapolis and want some, I’m happy to share. We had the butcher grind up the fat for us, so it’s super easy to use. 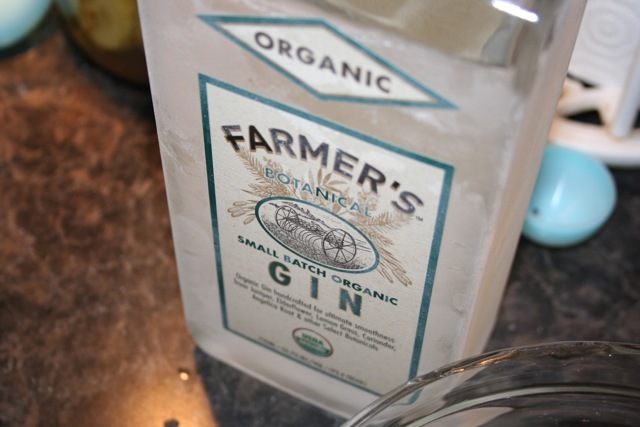 The recipe calls for gin, so we found this locally-produced one and it was fantastic. We had no trouble finishing off that bottle in the following days. We got quite a few packages of ground venison trimmings from the guy who cut up Adam’s deer for him, so the grinding part was done, which made the process faster. Mixing it all up took a little practice. The amount was really too much for our mixer (imagine pork fat chunks and chunks of raw venison hitting the walls of the kitchen). So we mixed it by hand. Because everything needs to be ICE COLD, mixing it with your hands kinda hurts! But Adam powered through. Next, fry up a little patty and sample it. Delicious. 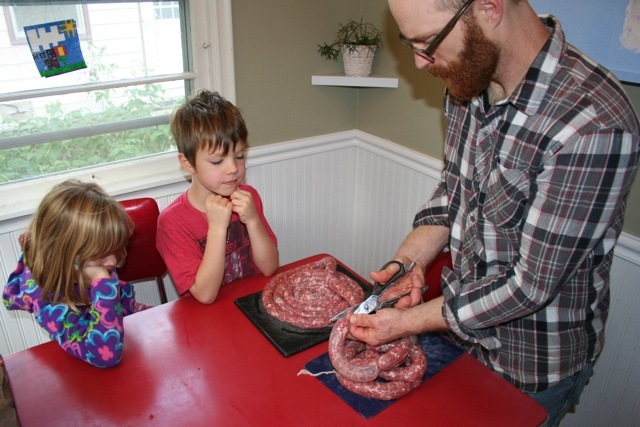 Now it was time to load Ye Olde Sausage Stuffer, with the casings (from Seward Co-op) and start making some sausage! The kids were fascinated and impressed. I was horrified and amused. 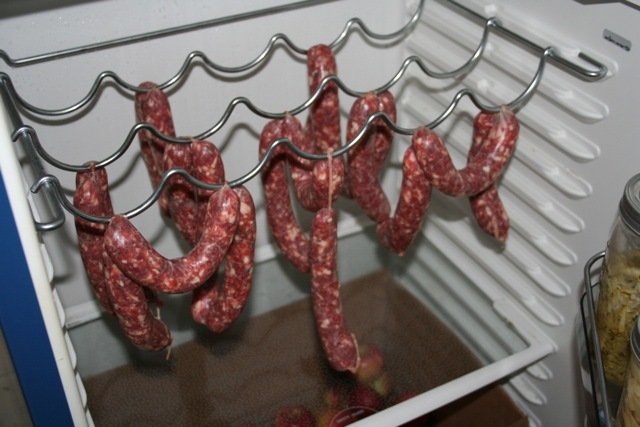 After stuffing you twist the long sausage into individual links. Finally, you hang it to dry in a refrigerator overnight. We were lucky that our small basement refrigerator came with this wine rack built right in. We’ve never used it for wine but it works great for this! The next day, we wrapped up packages of four links in butcher paper and froze them. We gave some to family, and have eaten plenty too. It’s delicious! I have the book Charcuterie by Mark Ruhlman from the library right now, and it has some different venison sausage recipes that I would also like to try. 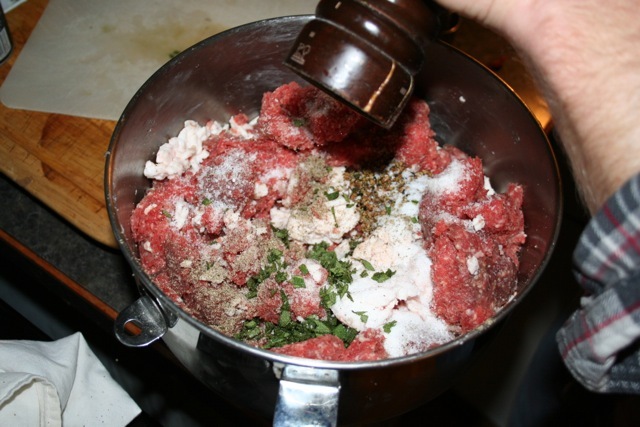 Rather than pork fat, Ruhlman uses a ratio of 3 lbs ground venison to 2 lbs ground pork meat. He also hot-smokes his sausages, a process which intimidates me a little bit, honestly. On the other hand, we’ll probably also make several more batches with this recipe, because what else are we going to do with all this pork fat? 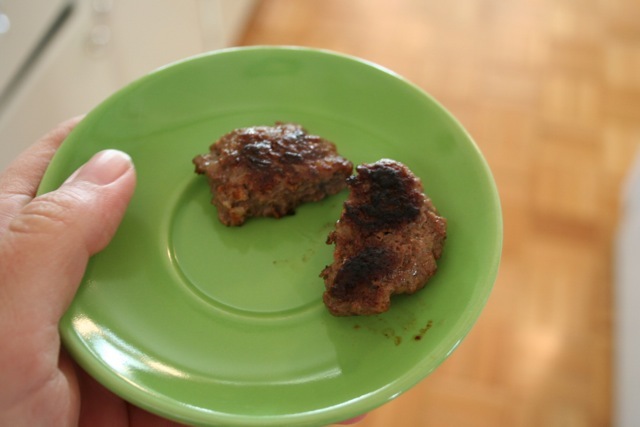 Any favorite venison sausage recipes you’d like to share? Categories: Cooking and baking, Practical | Tags: recipes, wild game | Permalink. 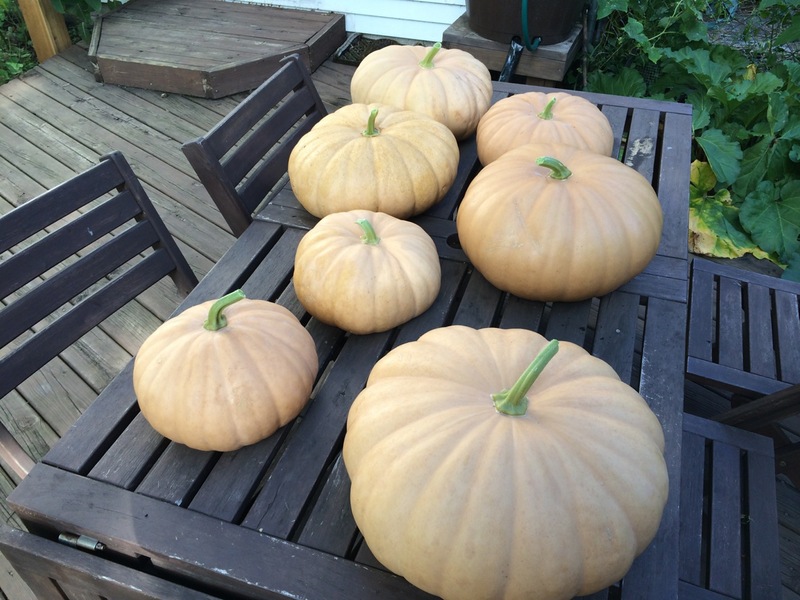 We harvested the tiny butternut squashes from our community garden plot this weekend. I also wanted to use up some of the kale that’s still in the garden, so we made plans to have squash, greens and bacon, and wild rice, but when the squash came out of the oven, we thought: why not combine them all and make stuffed squash? Alas that, in my eagerness to eat, I only took this low-quality cellphone picture. Find some small squashes. Whatever kind you like. While they’re baking, start some wild rice cooking on the stove. Fry some bacon, chop it up, set it aside. Then saute some onion and whatever greens you have on hand in the bacon fat. Toss in a few tablespoons of apple cider vinegar and a few hot pepper flakes. (See full recipe for bacon and greens.) When the wild rice is done cooking, toss with some olive oil, salt and pepper. 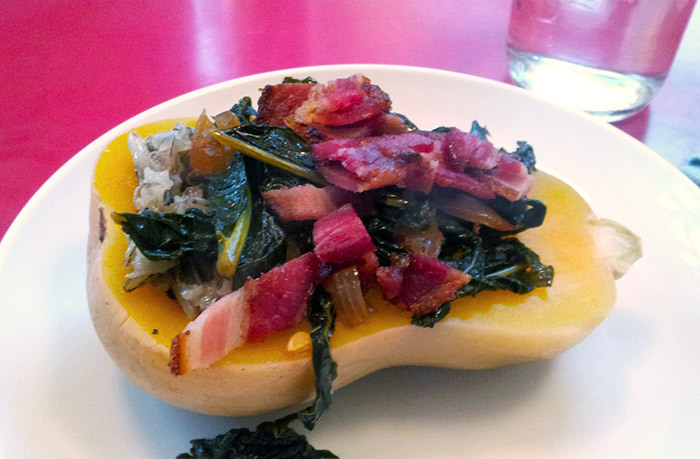 When the squash are done, stuff the hole of each with a generous spoonful of wild rice, then top with the greens, then the bacon. Drizzle a small amount of maple syrup over the whole thing. Wow. Even Miss Ultra Picky 6YO Who Will Basically Only Eat Venison At This Point ate this enthusiastically. Well, she didn’t throw a tantrum anyway.